Our Hardware and Software is totally designed and constructed by NAVLABS. We can (and have) modified our system to conform to your unique applications such as Terrestrial & Spaceborne Attitude Determination, Agricultural Applications, Pseudolite, Unique Interfaces, Rotating Antennas, etc. Inertial Measurement Unit Configuration: Onboard SDLC and bit-insertion provides electrical and data equivalent outputs for Honeywell HG1700 and LN-200 SDLC. Selected AMRAAM formats. Automotive Configuration: 4 Wheel independent programmable wheel ticks , 3 element programmable Rate and Acceleration sensor outputs, Reverse, Odometer, Stop. 50 MHz I/Q 32 BIT Data Recorder and Playback. MGUE J/S = 100. (optional) Records 600 Hz Inertial Measurement Unit Navigation and Auto Pilot message and all control bits. Playback is via MFIO RS422 differential pin out. CW, pulse, broadband noise jamming. User defined power levels to support up to 100 dB J/S. 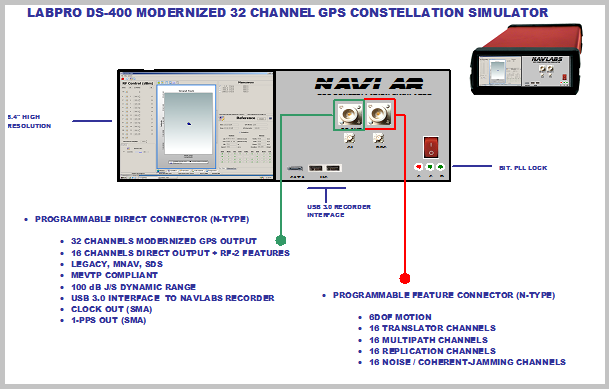 Stand alone or completley integrated with GPS Constellation Simulator. Power Levels and relative Doppler reflecting simulating dynamics and user vehicle antenna phase/gain patterns. 4U rack-mount chassis and LCD monitor. Windows O/S, DVD/RW, Ethernet. RF Output (N connector1/2), 1-PPS/Start (SMA), 10 MHz PLO (SMA). One year warranty and technical support. This system provides pseudo-MCODE (AES) and true M through simulator data sets in a 32 to 50 channel configuration. The principal application has been product verification and system validation. All software is provided such that the user can design mission-specific scenarios which can be run via Ethernet or at the system console.